Here's where I stand... or where I stood with Sinead Harnett: I absolutely loved her on the Disclosure album, and then on the Rudimental album. Those two could literally do no wrong when it came to picking vocalists for their debut albums and I don't know if the likes of Ella Eyre and and even Sam Smith to an extent would be without those as a platform. I really didn't enjoy Harnett's recent singles 'She Ain't Me' and 'Do It Anyway' which I was really disappointed by but I personally for me on a personal level just found them really bog standard British female pop artist, but I absolutely loved her single 'No Other Way' featuring Snakehips. So if you take that formula of putting Harnett alongside great electronic music producer types, we should be on to something good, right? Correct because the single 'If You Let Me' featuring Grades from Harnett's new self-titled EP is excellent. 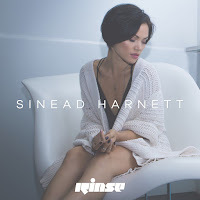 I actually think slow-jam Sinead Harnett is far better than big pop song Sinead Harnett but it's the balance between the two that is key. Still whatever Grades has done on this single is absolutely stellar. I don't know if this is the type of stuff that radio cares for, but it really should be. I really hate using the word "vibey" now, mostly because it's not a word but also because I've been doing this for so long that I should probably be better at words by now, but that's how I feel about 'If You Let Me'. That new EP I mentioned, the second track is called 'Rather Be With You' and that's quite good even though it's far more upbeat that 'If You Let Me'. These are the standouts on this EP, so if these tracks are a sign of things to come, it's lookin' alriiight.